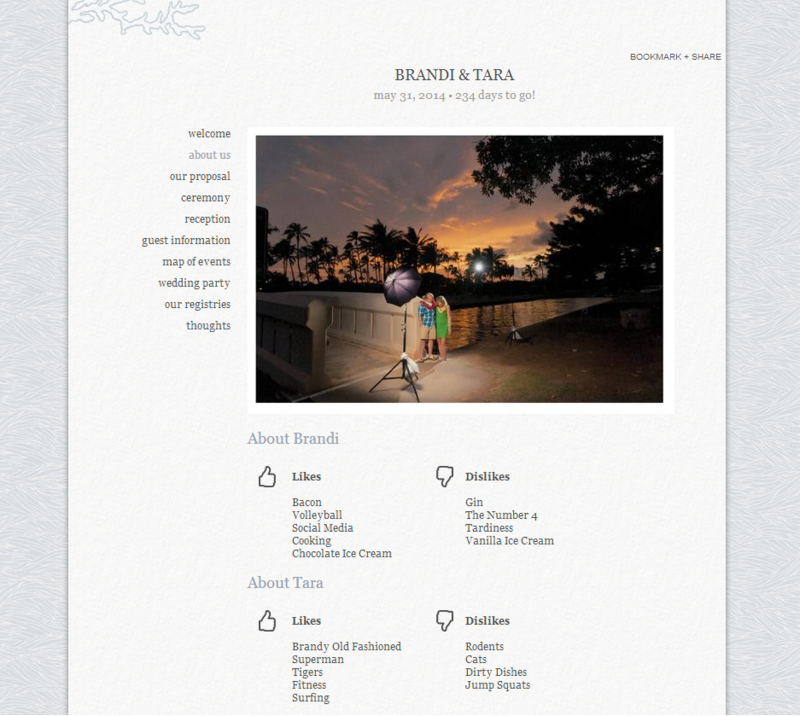 I am getting married in the near future and have been using theknot.com's handy wedding website tool instead of going through the hassle of creating my own site from scratch. They add more designs every day and I have finally (I think) settled on one. It's simple and focuses on the information, which is the point. The other nice thing about the website is that you can allow your guests to RSVP online, which saves them a lot of hassle and can save you postage! I'm excited to get to that point, but for now I am enjoying making my little modifications and packing it full of information. Over the past few years I have seen many wedding websites and they server their purpose, although I want ours to be fun and full of helpful information! It also needs to be easy enough for our guests to navigation and shouldn't be a book. I have added fun stuff like links to Facebook albums of vacations we took together and lists of likes and dislikes. I certainly do not expect every guest to read every word, but I want them to know that it is a wonderful source of information! Wedding party descriptions (at least my portion), links to my Pinterest wedding page, and fun articles are at the ready. I look forward to updating it more and providing guests with a full list of activities!